Sujet Pigs is a component of the GPI transamidase complex. It is essential for transfer of GPI to proteins, particularly for formation of carbonyl intermediates. 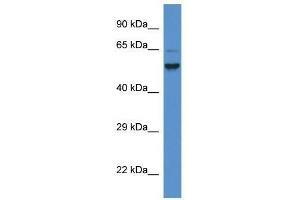 Synonyms: Polyclonal Pigs antibody, Anti-Pigs antibody, phosphatidylinositol glycan anchor biosynthesis, class S antibody, BC058979 antibody, Gm393 antibody, Gm689 antibody. Indications d'application Optimal conditions should be determined by the investigator. Stockage commentaire Store at 4 °C, following reconstitution, aliquot and store at -20 °C.